A rather late departure from Bairnsdale owing to my pulling off a corner protector and bending the rear bumper bar whilst reversing to hitch up the trailer, this necessitated a stop at my saviour, Ians - he removed the corner piece, chipped off the old sealant, cleaned it, then applied new Sika and put in new screw things (can't remember the name of them) then he and Mike, another motorhomer friend removed the rear bumper - JUMPED on it! to straighten it then replaced it. They joked they were going for their panel beating ticket. As it was 2.30pm we changed our minds about our destination and instead of driving down to Mallaccoota we stopped at Genoa, in their free rest area. What a pleasant surprise! Lovely park-like setting with brick toilet block, picnic tables and barbeques. The best surprise however came when the people opposite asked "is this Skye?" I said yes and they replied "then you must be Annie!" 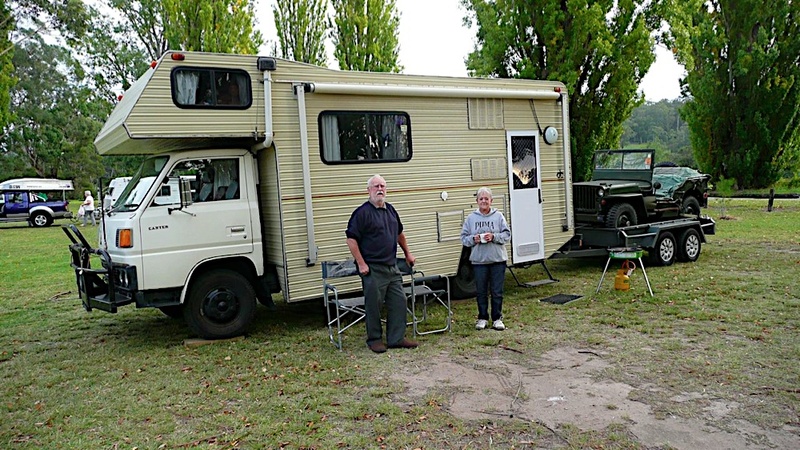 I was rather amazed and thought maybe they'd seen the writing on the side of Highland Drover - but no - they are followers of my blog - WOW - Alan and Gwenda the first people I've ever met who read the blog, who I didn't know. I feel quite famous!!!! This morning we were planning to spend the day and night at Mallacoota - Laurie set off about 10am and I (not being the earliest riser) was to follow after. Laurie phoned when she arrived and said the foreshore caravan park was packed AND they were charging $30 per night - we decided to give it a miss and stay at Genoa another night (you can't beat free). I decided to drive the Jimny the 20 (very twisting) kilometres to Mallacoota arriving just on 12 noon. Of course we had to find a good cafe - the only redeeming thing in this is we did WALK there. "Special Pelican Feeding Station" - actually it's where lucky fisherfolk clean their catch. Built during the second World War, the Mallacoota Bunker was never intended to be, nor was it ever used as an air raid shelter, or as a fortification, it was the headquarters of RAAF coastal intelligence actvity in the region. The main purpose of its operations was surveillance of the area to assist in keeping our sea lanes open. ....two ships were sunk off Gabo Island. The freighter "Iron Crown" was the only vessel torpedoed by a submarine in Victorian waters with a loss of 38 lives.